It’s been almost 2 years since I was last at the District Cafe in Woodstock, Cape Town. Recently I’d been hearing of how they’ve changed their menu and have more of a focus on grills and steaks compared to the coffee shop fare they had started out with. Even back then I felt they had a lot to offer for a coffee shop, so when I was invited to revisit the District Cafe by the owner Sharfudien Parker and his wife Rahima, I was keen to try out the menu I’d been missing out on for so long. Situated high up on Roodebloem road almost up to the N2, you may be forgiven for thinking you had passed it by. Signage is a bit understated but you’ll spot them in a brown building on the corner before the N2 off ramp. The decor is casual and not much has changed from 2 years ago. They have added another section to the restaurant though. The adjoining room could use a bit of the decor touches from the front section but the extra space is a blessing when they are busy. It’s also a good space to host a small group for a party. On arrival we unexpectedly ran into some family members. We joined the party and filled up the comfy booth in the corner. The big storefront windows allows in a lot of light in the daytime and you can look out onto the passing trade and traffic. The big counter houses some yummy desserts and several people were in and out to collect take outs as well. Our waiter was attentive and recommended the Chef’s Platter as it would give us the chance to try a bit of all the grills on the menu. 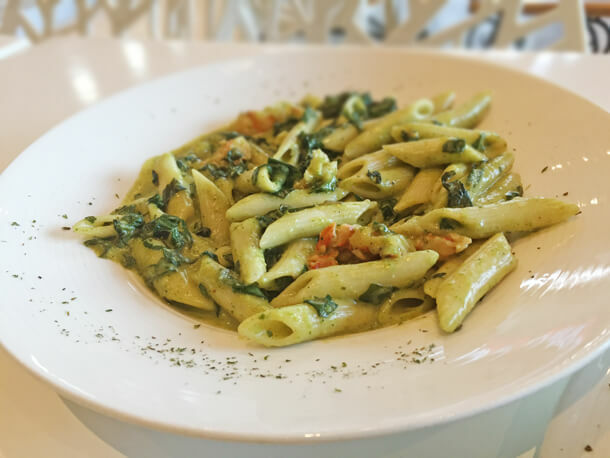 I wasn’t really in the mood for meat so I opted for the Prawn Pesto Florentine pasta. The Steak Fillet Burger nearly made me reconsider – Basted Fillet steak with greens, tomato, red onion, roasted nuts & mustard sauce. I’d not had roasted nuts on a burger before and was keen to try but I talked myself out of it deciding I would save it for next time. We ordered chicken nuggets and chips for the little guy which came out quickly before our order. 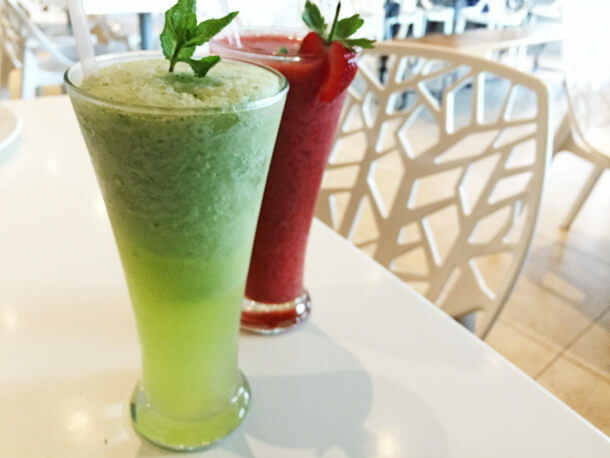 While we waited for our mains we sampled the Strawberry and Mint Crush and the Refreshing Mint Lemon Breeze from their mocktails menu. They were both delicious but the Mint Lemon Breeze was the bomb. Their juices are all the fresh pressed variety from Sir Juice. Fresh pressed is always a challenge with small children as they don’t like the texture. Would be great if they included some smooth and simple juices for the littlies. Our food arrived and the platter of meat was both a carnivore and banter’s dream. 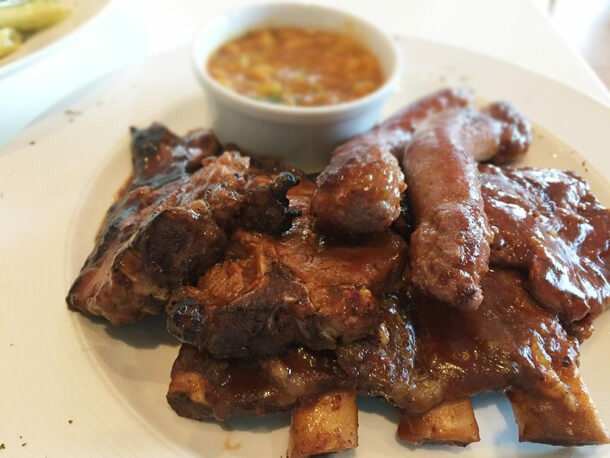 A selection of steak, chops, sausage and ribs basted in their special sauce with a side of chilli beans. My prawn pesto pasta was generous and tasty but paled in comparison to the hearty grill platter. The meat was succulent and the basting unique, bbq with a spicy kick without tasting like masala. I’m quite fussy about sausage. And won’t easily order a dish that contains sausage, but at last, I had found a sausage that was truly good. Sharfu would not give away his supplier though, no matter how nicely I asked. 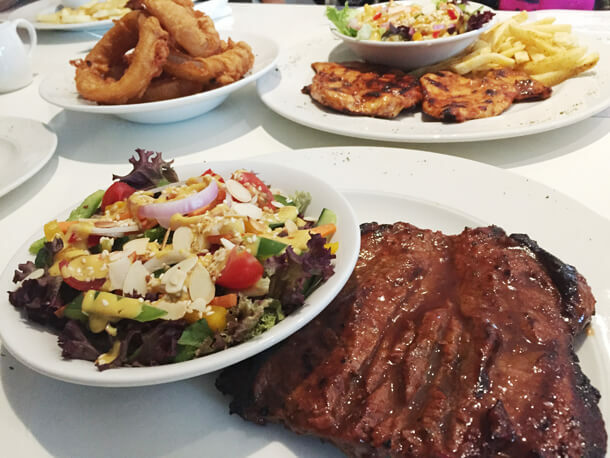 Suffice it to say the grill platter had to be shared. Prices are reasonable, my pasta was R79 and the mountain of meat is on special for R189. Their 200g fillet steak is R120, which is the cheapest I’ve seen lately, and their burgers start at R47 and come with fries or salad. The rest of our party also enjoyed grilled chicken fillets and a light grill platter which contained chicken skewers, beef olives and a crumbed cheese and chicken croquette that was served with cheese sauce. I like the chopped salad that came with some of these dishes topped with flaked almonds and sesame seeds. My aunt’s rump steak was slightly too well done (which the owner immediately offered to replace). She was also banting and requested a coleslaw, which was not on the menu, but they made a plan a whipped one up especially. It’s this kind of touch that keep their customers coming back. We had taken home a slice of carrot cake and baked cheesecake with a toffee caramel topping. Late that night we sat sampling it on the couch when T had finally gone to sleep. Both were really good. The carrot cake moist with a hint of spice but the cheesecake was really excellent. The texture creamy and smooth without being dry as baked cheesecakes sometimes can get. I swear I could practically hear the calories popping on around my waist but I didn’t really care… pass me the other slice…. On chatting with the owner earlier the evening, I found there is an obvious commitment to serving good quality food. While the District Cafe is not fine dining, he is very particular about the standard of the menu. I find there to be interesting items on the current menu and he tells me they are in the process of producing a new menu. This will feature most of the existing one but with a new look and feel and some new additions. Some signage and branding changes can be expected in the very near future as well so you’re less likely to miss them and end up on the N2, like I almost did ????. I don’t know why it took me so long to go there after the first time. It certainly won’t take that long again. 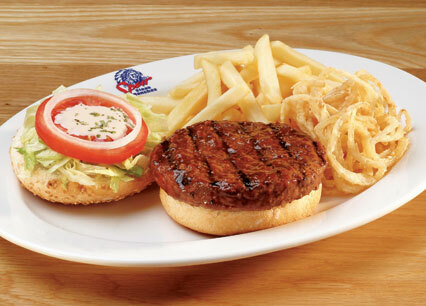 That Steak fillet burger is calling my name…. They are now also open on Friday nights and Saturdays but closed on Sunday. This is a sponsored post as I was invited by the owner. All opinions are expressly my own. Woodstock, a place that 10 years ago was so grungy and scary, you would have thought twice about going there to shop let alone eat out. It has since undergone quite a facelift and is still in the process of being re-vamped and beautified. Don’t get me wrong, the lower side of main road is still pretty scary but above that it’s really starting to look quite pretty. 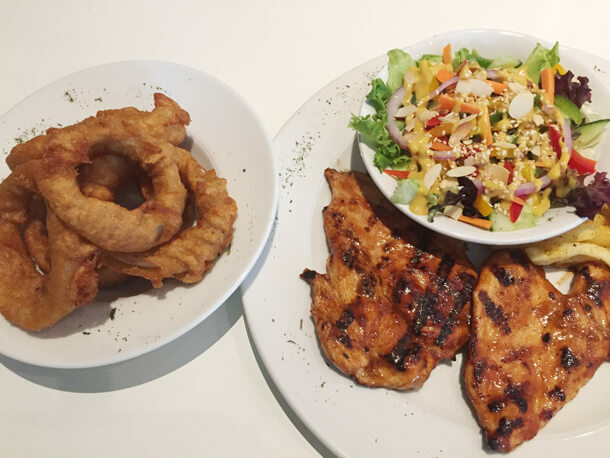 District Cafe is located high up on Roodebloem road right opposite the well known and well loved Dom Pedro’s. Woodstock is generally quite artsy and eclectic and it was nice to take in the vibe again. We parked just off Roodebloem outside Dom Pedro’s. They had done up one of the outside walls with historical photo’s of Woodstock in distressed wooden frames. It was a lovely display and I must admit to being pleasantly surprised that the frames hadn’t been stolen right off the wall. Things must really be improving. Forgive my cynicism. I used to work in Woodstock many years ago and petty crime was rife back then. I had chicken pasta in a napolitana sauce that had a hint of curry. It was quite enjoyable and I polished off the generous portion. My hubby’s steak and mustard wrap though is what I would go back for. It was excellent and came with a side of fries. The cappucinos we had were excellent and came complete with a perfect flower and heart on top of the foam. The barista is definitely well trained. The menu is not huge but it’s interesting like the Chicken and Pineapple Wrap with avo, pineapple, tomato and cheese served with cranberry sauce or the District Light…Lighter Meal with Beef Olives and Chicken Skewers served with sauce. Price-wise I found them very reasonable. My pasta was generous and only R50 and their Steak Fillet burger is only R40. They also have lunch specials which change on a daily basis. It’s a pretty casual place and I’d say they’re quite child friendly as well. They even have Coco Pops as an option on their breakfast menu but I forgot to ask if they keep baby chairs. I’d like to try them again on a weekend, maybe for dinner. I’m sure the vibe would be quite different then. Definitely a do again. I have been to the District Cafe for brekkie/ brunch on numerous occasions. Despite the group always being big, the service has always been excellent. The food is awesome, the portions are generous. I would recommend the District Cafe to anyone wanting strictly halaal and wholesome food at affordable prices. Thumbs up to the management and staff of District Cafe- you guys have a good thing going! I have never been disappointed. I’ve ordered from District cafe numerous times and have thoroughly enjoyed their food. I often just do call-and-collect, but have been to sit down a few times and the service has always been good — the experience has been great since I went the the first time (about a week after they opened) till the last (about 2 months ago). Consistency in great flavour and service.